J. Cole celebrated his 31st birthday last week, with the surprise release of a new album, titled Forest Hills Drive: Live. The 13-track album boasts live recordings from the rapper’s sold-out show at Crown Coliseum in his hometown of Fayetteville, North Carolina. It was also featured in his HBO documentary, Forest Hills Drive: Homecoming. Cole was born in Frankfurt, West Germany but relocated to Fayetteville, where he was raised by his mother. 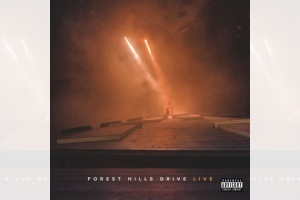 In addition to songs from 2014 Forest Hills Drive, the live set also includes a medley of Lights Please, In the Morning, and Nobody’s Perfect.